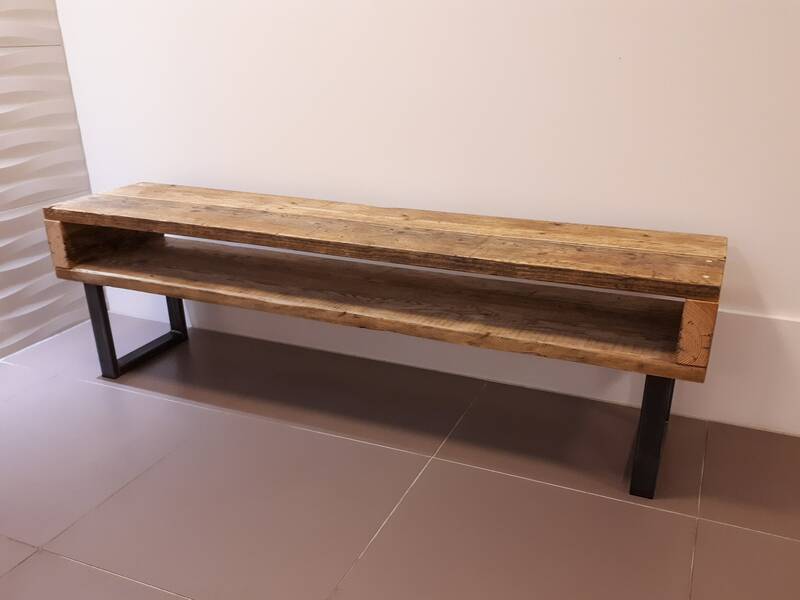 A simple yet versatile piece of furniture made from reclaimed scaffold boards and 50x25mm box section steel. 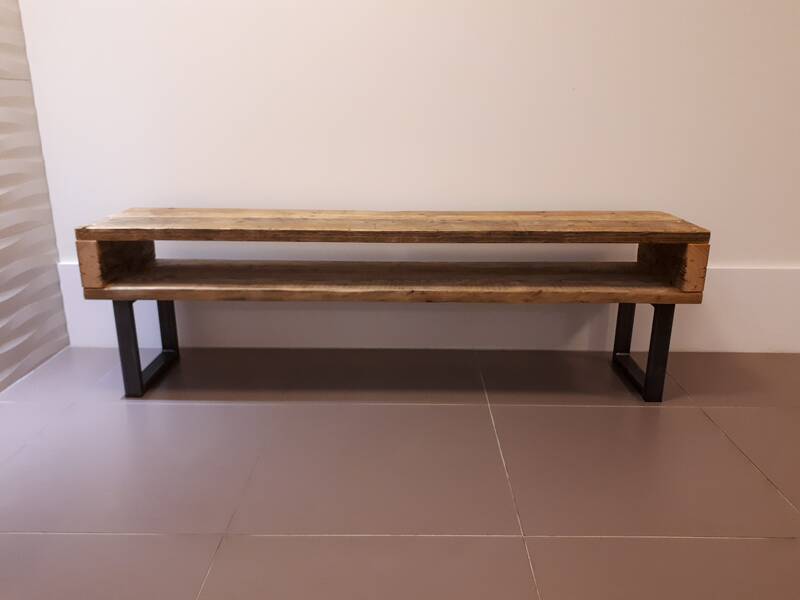 Could be used as a sideboard, coffee table, tv unit or console table. Timber is finished in Danish oil and the steel is left natural. Standard sizes available but as always please get in contact if you require something bespoke. Height: 50cm, depth: 44cm, gap between top and bottom boards: 13cm. Legs fitted with plastic inserts to protect flooring from scratching. Please contact us with the size you require and your postcode prior to ordering as we maybe able to deliver or depending on the size offer a cheaper rate than advertised. All our items are built to order so please get in contact if you require a size that isn’t listed. We are also happy to produce items to your own design etc. Unless stated all products using scaffold boards are finished using a Danish Oil. Where an item has a steel frame the steel is left in its raw natural state. If you require a piece for outdoors please let us know and we can varnish the timber and arrange to have any steelwork powder coated (added cost). 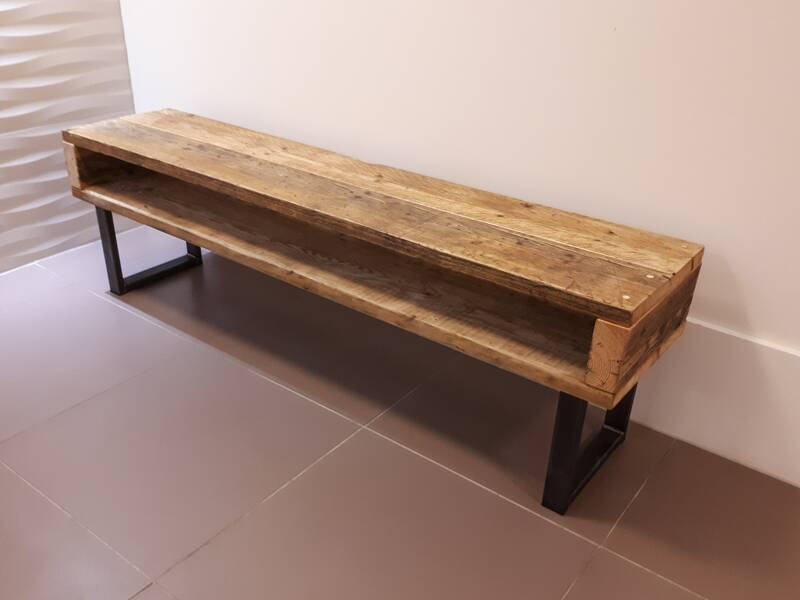 Based just south of Herne Bay in Kent, Gibbs Design Furniture is a husband and wife team that makes furniture for indoors and out plus other rustic and industrial style items from pallets, scaffold boards and other reclaimed timber often combined with steel. The timber we use is sourced locally whether it's pallets, reclaimed scaffold boards or other timber. Our workshop is powered by solar panels and any scrap wood is burnt to keep us warm. As our items are made to order and at certain times of year we are very busy so there may be a delay in shipping orders but we will keep you informed if this is the case. As all items are unique and individual. The colour, markings and texture of the timber will vary from piece to piece. We are happy to deliver to most of East Kent free of charge for large items. Deliveries further afield eg West and North Kent, Sussex, Surrey, Essex and London we can deliver ourselves so please contact us for a price. Please contact us with your postcode regarding shipping to all other areas of the UK. Generally most small items will go courier with larger items shipped on a pallet. Items sent via couriers will generally be delivered to your door. 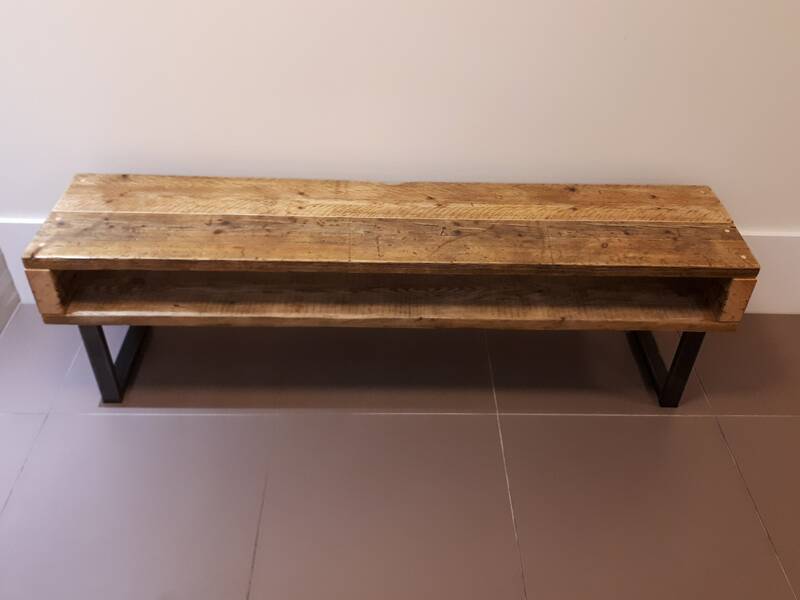 There may be cases where this isn't possible without help from you eg a long scaffold board bench would be sent via a courier and although not that heavy is a bit awkward to carry up stairs etc. Items sent on pallets (and this could be multiples of smaller items) will only be delivered to the roadside or driveway of your property. Pallets can be left on driveways by prior arrangement but in the case of a roadside delivery please make sure you are able to unpack and get the items into your property at the point of delivery as the drivers are unable to aid with this. Payment can be made via Etsy or cash on collection / delivery. Items sent via couriers will generally be delivered to your door. There maybe cases where this isn't possible without help from you eg a long scaffold board bench would be sent via a courier and although not that heavy is a bit awkward to carry up stairs etc. To fulfil your order, you must provide us with certain information (which you authorised Etsy to provide to us), such as your name, email address, postal address, payment information, and the details of the product that you’re ordering. You may also choose to provide us with additional personal information (for a custom order of furniture, for example), if you contact me directly. We may store and process your information through third-party hosting services in the US and other jurisdictions. As a result, we may transfer your personal information to a jurisdiction with different data protection and government surveillance laws than your jurisdiction. If we are deemed to transfer information about you outside of the EU, we rely on Privacy Shield as the legal basis for the transfer, as Microsoft Cloud is Privacy Shield certified.